We are curious beings. During our childhood days, we tend to ask a lot of things to our parents. That is natural for a kid in his/her early stages of development. For the first few years, our questions about anything get answered by our parents. But as we go to preschool, it is our teachers who do that. Then it continues to grade school, high school, and then college. At some occasions, it continues to the masters and doctorate courses. It’s a different person but the same profession: teachers. Basically, they are one of the core people who answer our questions and often provide us with facts that we did not know of. Being a teacher gives one the opportunity to shape the future leaders of the world. If you ever plan on becoming a teacher, then go for it. But, just like any other applicant, one has to fill up the application form to be a teacher. 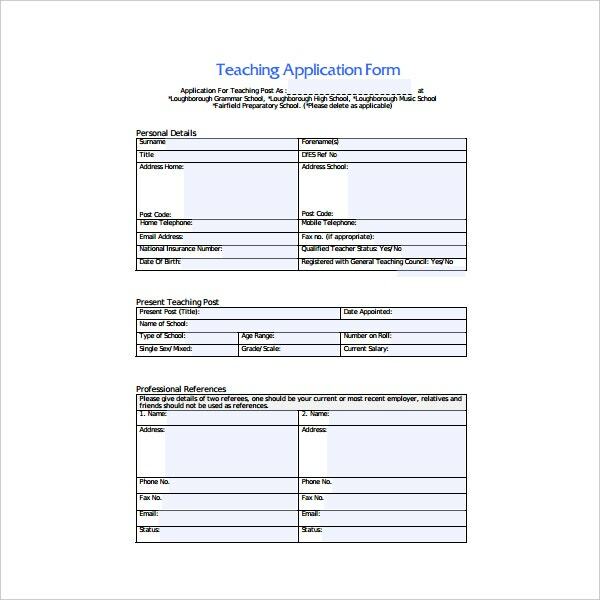 This template will show you some templates of a teacher application form. 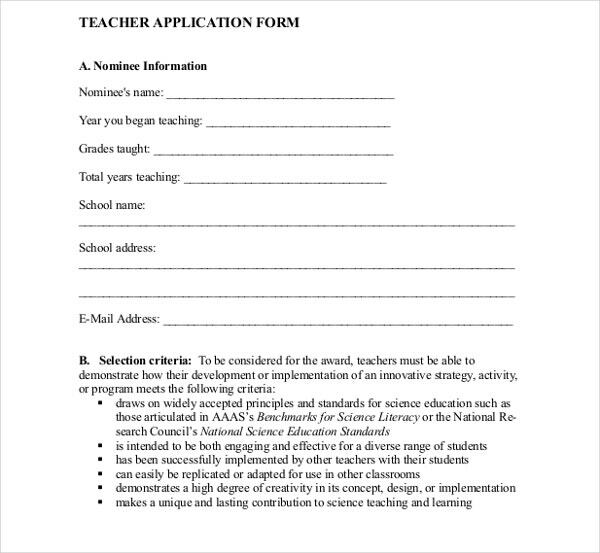 In addition to that, we will also be enumerating the parts of the teacher application form. Furthermore, we will also be telling you the importance of being a teacher and tips on how to be a great teacher. So, please do take note of the important information which will be present in the next few paragraphs. Every company and institution has an application form. Be it through online or offline, the purpose of the application stays the same. That purpose is for an individual to fill up if he/she wants to work in the said company or institution. Application forms are also used if ever you are planning to have different government ID’s. 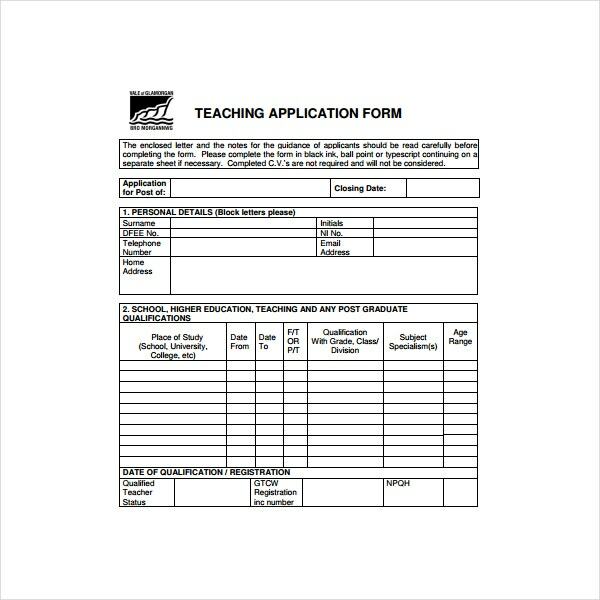 For the benefit of this article, we will only be showing you the parts of a teacher application form. Although not every constitution has the same structure for this type of application form, the common and important elements of such a form are present in all, no matter which institution you apply for. You may also see school application templates. This is where you should state what position you are applying for. Since you are applying for the teaching position, you have to specify which field of study you would want to teach. You may also see sample application forms. This will basically include your name, address, contact number, gender, date of birth, nationality, and email. This needs to be filled up if you are already married. The information that is supposed to be filled is the same as your general information. You will have to say if you have children or not and if you do, fill up their general information as well. This will go from the very beginning. From preschool to college, you have to fill up where you gained your educational background and list their respective addresses and sometimes, fill in your awards and honors from each institution. You may also see college application templates. In this part, you have to fill up your medical history and which things are you allergic to and state if you have been diagnosed with a mental illness in the past or now. You may also see membership application templates. Mention all the past companies you have been with and state what was your job description. You have to state why you want to apply to the institution and why you want to teach this particular field of study. Make sure you don’t have any grammatical errors so that you will be perceived with more credibility and higher chances to get an interview fast. Make your reason heartfelt and genuine without being too dramatic. Have a balance in writing it and make it still look professional. You may also see job application forms. 1. They inspire. Can you just imagine someone teaching for eight straight hours every day? Not to mention that they have their own personal life to attend to. Just that mere awareness of what a teacher goes through every day can inspire his or her student to excel if he or she exerts effort to it like his or her teacher. You may also see application for employment forms. 2. They try to make things easy. No matter what educational level you are in, a teacher will always try his or her best to explain in a manner that the students would comprehend and understand easily. In some cases, they repeat what they will discuss slowly or find another way so that one would understand. Teachers like that are one of the most genuine. You may also see free applications. 3. They educate. Probably one of the most common and yet important things a teacher does is that they serve as our book of knowledge. As we grow older, these books (teachers) become bigger because of the information they will give you. You may also see application template samples. 4. They sacrifice. It is said that even if teachers have one of the most important jobs in the world, they get paid low. But, even if that is true in a way for some, they still continue to teach. This profession is perfect for people who would not mind going out of their way to help others and make them happy at the same time. You may also see application form samples. 5. They talk about life. This goes to those teachers who teach in a more experiential way. Their discussion is not only limited to their subject given but they tend to add the realities of life and how you can still achieve even if life puts you down. Those kinds of teachers are the ones who propel students to reflect more on what they really want to be and if what they want to be is worth pursuing. With that being said, was there a teacher you remembered while reading this line? 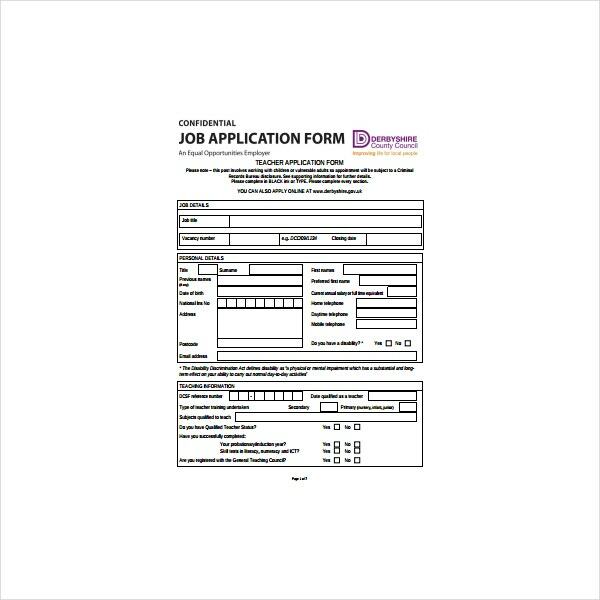 You may also see application form template samples. Now that you know the importance of being a teacher, it is time for you to know what does it take to be a great one. If ever you are planning to be a teacher and you are serious about being the best out there, we will provide you tips that can help you with that long-term goal. Since people are different, as a teacher, you have to know when to adapt and how to so that each student would be able to understand what you are lecturing about. So get a pen and paper and list down these tips we will be mentioning. 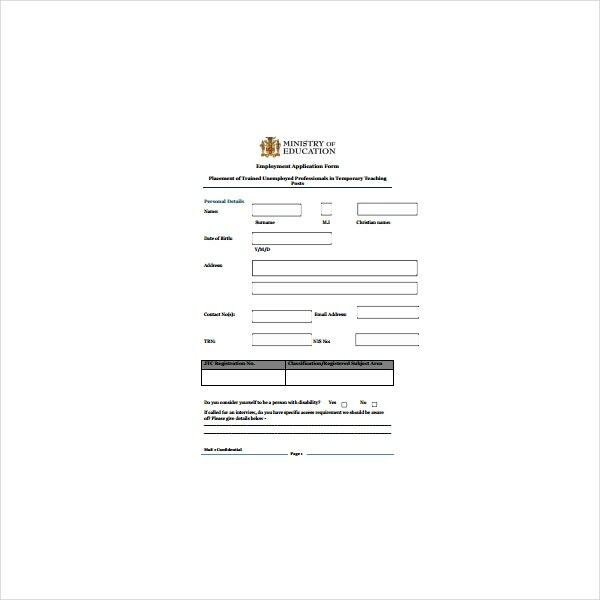 You may also see account application form templates. 1. Be a companion. Often, students find it very hard to approach some teachers because of how they look. If teachers would only know how to also change from being a teacher to be their friend, students will e much more comfortable with you. But always remember to not go far in being too friendly or your personal relationship with that student might affect on how you perform and function in the job. Always know where you stand and where are your limits. You may also see lease application forms. 2. Don’t limit to the chalkboard. Students often learn better if their teacher is adventurous in his or her teaching strategy. If the teacher is not only limited to the blackboard and actually tries to apply what or she is teaching to the students through an activity, then students might come to understand a certain topic better than before. Knowledge is not complete without the actual application. You may also see sponsorship application templates. 3. Know when to switch. By this, we mean that a teacher should know when is the proper time to be strict. This is convenient if the students are already so slacked and not listening anymore to what you have to say during your lecture. But this does not also mean that you should be strict always. Adapt as much as you can and keep the energy high for the students. You may also see assistant job application letters. 4. Believe in them. Teachers who believe in their students and constantly push them to their limits and appreciate what they are doing are the best ones. That is one of life’s greatest feelings if ever a teacher would remind you that even if you are at your lowest points, he or she still believes in you and reassures that. Sometimes, having a teacher believes in you gives a big boost that can be carried out still later in life. You may also see donation application form templates. 5. Don’t stop learning. Even if you are already a teacher, never close your doors to knowledge. Study more about your subject even if you are already a master of it. Don’t also limit yourself to that. Adding additional knowledge to your lectures can amaze students and makes them think that you are so smart and slowly they can be influenced by you. Be a role model and show them that you can still work and study at the same time. You may also see blank job application templates. So these are basically the tips. Always remember that you can never be great in teaching if you are inconsistent. Being inconsistent can affect your students and perceive you as a bad teacher. A teacher should serve as a role model for their students. Teachers who go out of their way for their dear students as, what we have mentioned, are one of the best and if a student sees that, your behavior can affect him or her and would carry that to his or her life. Take note that you as a teacher will never go out of your way for your students if you are not doing it genuinely. To help one is to be genuine also. Set it up in your mind that you are there to help someone improve their life. Guide them and when the time is right, let them go as they need to face the world on their own. You may also see vendor application templates. As you can see, being a teacher is like being a parent also. You mold them from the start and push them a little bit further when they start to grow. Once they are old enough, tap them on the shoulder and give your best wishes and say goodbye. One day, when you two will meet again, you will be surprised on all of the flashbacks and memories you have undergone with this particular student and how you have affected his or her life. But remember? You will teach many. 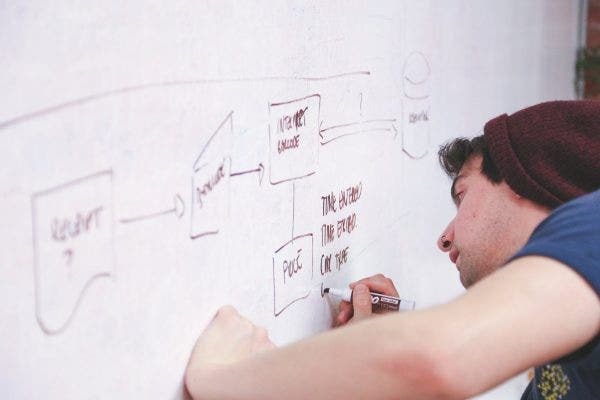 This solely means you have the possibility to influence over thousands of students in a small portion of their lives that can be useful in the long run. You may also see lease application forms in PDF.